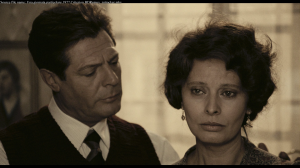 Italian cinema dream team Sophia Loren and Marcello Mastroianni are cast against glamorous type and deliver two of the finest performances of their careers in this moving, quietly subversive drama from Ettore Scola. Though it’s set in Rome on the historic day in 1938 when Benito Mussolini and the city first rolled out the red carpet for Adolf Hitler, the film takes place entirely in a working-class apartment building, where an unexpected friendship blossoms between a pair of people who haven’t joined the festivities: a conservative housewife and mother tending to her domestic duties and a liberal radio broadcaster awaiting deportation. Scola paints an exquisite portrait in muted tones, a story of two individuals helpless in the face of Fascism’s rise. Nominated for two Academy Awards (Best Actor and Best Foreign Language Film) this is one of Scola’s finest achievements.